Today is the 85th birthday of the crown prince of the French New Wave (Nouvelle Vague) film movement: Jean-Paul Belmondo. Eschewing the popular subject matters and film making methods, the New Wave artists created movies using natural lighting, unorthodox editing and unconventional plot developments. If you ever get a chance (it is available on several streaming services), please watch Breathless. You won’t be disappointed, maybe a little ennui, but it’s worth it. The world is a better place because he is in it. BEST KNOWN FOR: Jean-Paul Belmondo is a French actor best known for starring in Jean-Luc Godard‘s Breathless. Jean-Paul Belmondo was born on April 9, 1933, in Neuilly-sur-Seine, France (near Paris). His father was a sculptor and his mother a painter, but in his youth Belmondo seemed to be headed toward athletics instead of the arts. However, though he tried his hand at boxing, Belmondo ended up at the National Conservatory of Dramatic Art in Paris, where he studied acting. After his graduation in 1956, it wasn’t long before Belmondo could be seen on the big screen. He appeared in films such as À pied, à cheval et en voiture (1957; By Foot, by Horse and by Car), Sois belle et tais-toi! (1958; Be Beautiful but Shut Up) and Les Tricheurs (1958; The Cheaters). While early roles for the unconventionally handsome Belmondo were minor ones, his charisma was undeniable, and he caught the eye of director Jean-Luc Godard. Belmondo was cast in the lead role in Godard’s debut feature film, À bout de souffle (1960; Breathless). In the movie, Belmondo’s character, an admirer of Humphrey Bogart, kills a policeman and then hides out with his American girlfriend while plotting his ultimate escape. 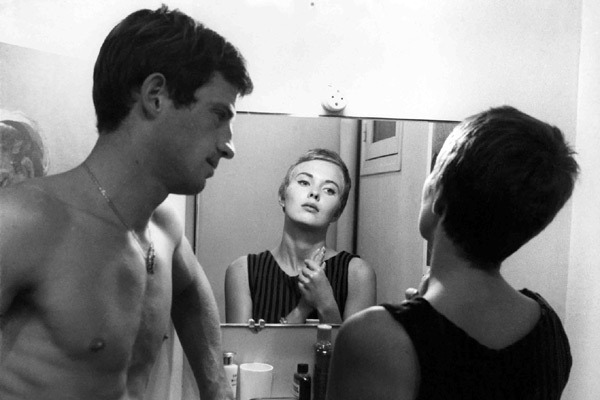 Breathless was a landmark film that heralded the French New Wave. It also shot Belmondo (and Godard) to stardom, with Belmondo being lauded as France’s answer to James Dean. Belmondo, however, wasted little time in taking on roles that fell outside of the viewing public’s perception of him. In Vittorio De Sica’s La ciociara (1960;Two Women), which starred Sophia Loren, Belmondo embodied a gentler character. Films like Cartouche (1962; Swords of Blood) and L’Homme de Rio (1964; That Man from Rio) gave Belmondo the opportunity to work in more physical roles. (Harkening back to his athletic past, he soon gained a reputation for doing his own stunts.) Belmondo also appeared in the James Bond spoof Casino Royale (1967). With Une femme est une femme (1961; A Woman Is a Woman) and Pierrot le Fou (1965; Pierrot Goes Wild), a gangster road movie with musical touches, Belmondo reunited with Godard. Belmondo also worked with another leader of the French New Wave, François Truffaut, when he appeared opposite Catherine Deneuve in La Sirène du Mississipi (1969; Mississippi Mermaid). However, Belmondo began to focus more on action films and comedies as his career progressed. At the end of the 1980s, Belmondo was a dramatic actor whose maturity was his strong suit. He started performing on the stage once more in 1987, while continuing to appear in films. For his work in Itinéraire d’un enfant gâté(1988; Itinerary of a Spoiled Child), Belmondo received a César (France’s equivalent to an Academy Award). Belmondo was slowed by a stroke he suffered in 2001, but he returned to the movies in 2008’s Un homme et son chien (A Man and His Dog). Instead of trying to work around his physical limitations, he played a character with the same disabilities. Today, Belmondo remains a respected actor who is a cultural icon in his homeland and around the film-loving world.